Columbia OS-2080. 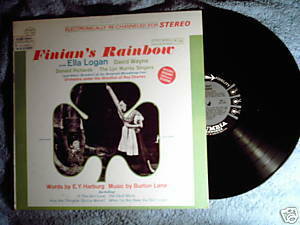 Finian's Rainbow as produced by Lee Sabinson and Wiliam Katzell. Music by Burton Lane. Sung by Ella Logan, Donald Richards, David Wayne, and the Lyn Murray Singers, and other members of the original Broadway cast. First performed in 1947. Vinyl is VG/VG; cover with photos is VG with "Demonstration" stamp on reverse; Columbia 6-eye.